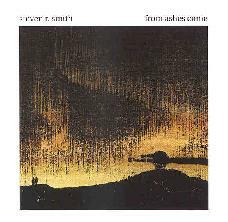 Steven R. Smith - "From Ashes Come"
Smith is a talented multi-instrumentalist that also plays in the improv quartet Mirza on the Darla label. On 'From Ashes Come,' he offers eight all-instrumental works that fall along similar lines, i.e., experimental excursions into mild dissonance and unusual sounds. The liner notes are (again) bereft of biographical information, so I am left to guess as to what instruments are really creating all these peculiar noises. 'Loomings' opens the album in strong fashion, odd nasally sounds (is that a harmonica?) carrying on over acoustic guitar strumming, and a taste of controlled feedback at the end. 'Footfalls Stitched Among Others' seems more like Japanese folk music, as it clangs about under screechy violin bits and what sounds like a cello. Smith stretches out on 'Her Walking Dress,' as a buzzing drone builds up and down late in the track towards an insane finale of backmasked sounds. Crazy. The sweeter 'Latitudes' recalls mid-70's Cluster, the use of echoes on the piano parts working very effectively. Nearly a full band contingent (i.e., guitar/bass/drums) comes forth on 'Behind and Before', another longer tune that develops an ebb-and-flow sense, and yet more freaky noises. In contrast, tinkly piano chords and echoey drone guitar characterize the penultimate track 'Tow-line onto Surface.' 'To Rise and Move On' finishes off the album with a little more movement and a number of intertwining melodies. Smith is kinda 'out-there' at times, and so his music is not always the easiest to digest. Like Ebeling-Hughes from Detroit, he knows his way around a studio and can create just about any sound or noise imaginable. The ratio of sweet sounds to nasally dissonance is rather low on this album, though it's really the lack of any truly shining moments that makes this mid-length/mid-price album less favorable than the excellent 'Iron Compass Flux' by the parent group Mirza. Still, I admire the guy's work here. Contact: Autopia, P.O. Box 420541, San Francisco, CA 94142.